Resolving Everyday Conflict is an eight-lesson study that unpacks the amazing things the Bible has to say about conflict and relationships. As you go through this study, you'll find the powerful and practical answers you are looking for to forever change how conflict looks in your life. The Church - Equip your church members and give them a tool for outreach to the community: This small group bible study will first provide the foundational biblical principles for relationships to your church members—perfect for use in your existing small group ministry. But this study also will help your church reach people that you might otherwise have trouble reaching—the people on the fringe of your church life as well as the unchurched in your community. By offering this study in your church or in other contexts (prison ministry, homeless shelters, crisis pregnancy center, etc. ), you can give people practical help with an issue that is relevant—conflict—and teach them about Jesus at the same time. The Workplace - Help employees deal with conflict at work (and everywhere else): Studying Resolving Everyday Conflict in the workplace has two key benefits: 1) It will help your team members by giving them practical tools to handle conflict at work and outside work; and 2) It is good for your organization—as your team learns to resolve conflict quickly and constructively (or avoid it altogether! ), you'll have a healthier and more productive work environment. Even in the healthiest churches, conflict and leadership are interwoven threads--there's no escaping those moments when tension surfaces in a leadership meeting, when you are leading your congregation through an difficult change, or even when you inadvertently create conflict yourself. Yet these are the moments when leadership really matters. 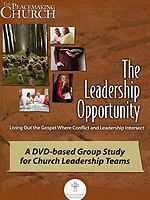 The Leadership Opportunity helps leaders live out the gospel by providing solidly biblical and practical help for the common conflicts that all leaders face.